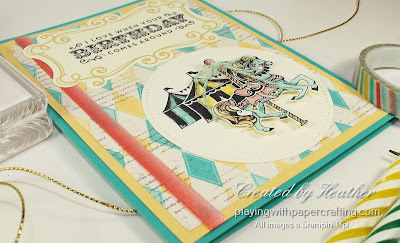 Playing with Papercrafting: Let's Go to the Fair! January is one of our family's birthday months. 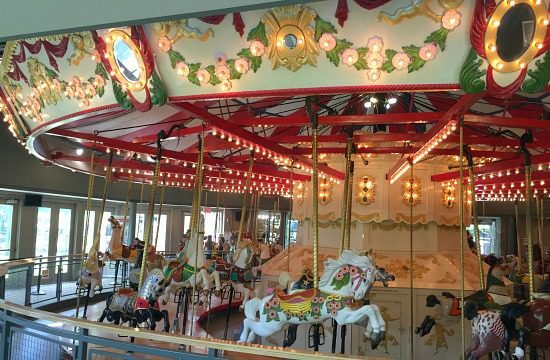 Besides me, two of my little grandsons have January birthdays, two nieces and two good friends also were born in January! So I wanted to get a bit of a head start on the birthday cards! This one is for one of the grandsons. 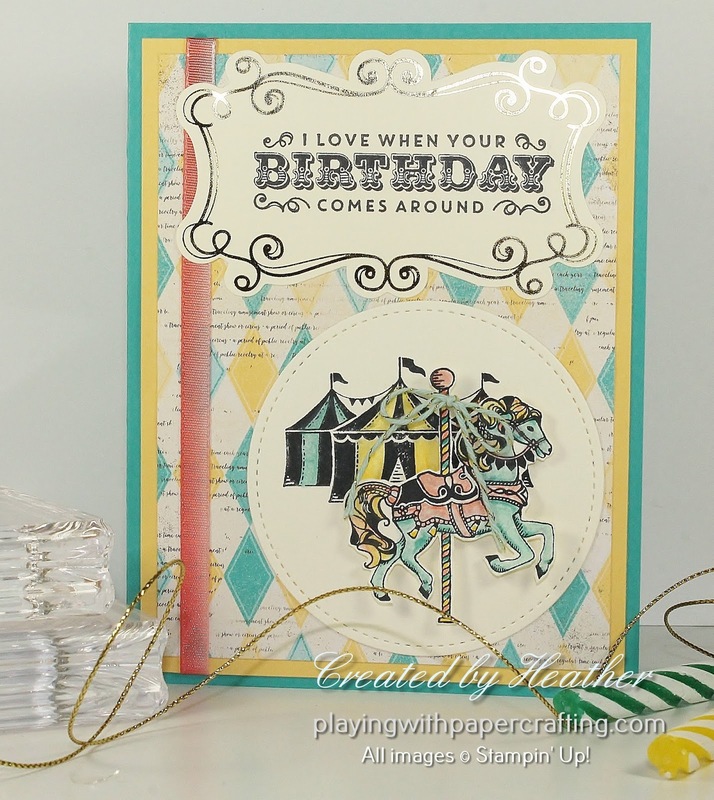 I just love this vintage looking set with the circus tents in the background and the carousel horse in front. It's from the Carousel Birthday** stamp set and it's part of the Cupcakes & Carousels Suite** of products in the new Occasions Catalogue, which you will be able to order from starting January 4, 2017! 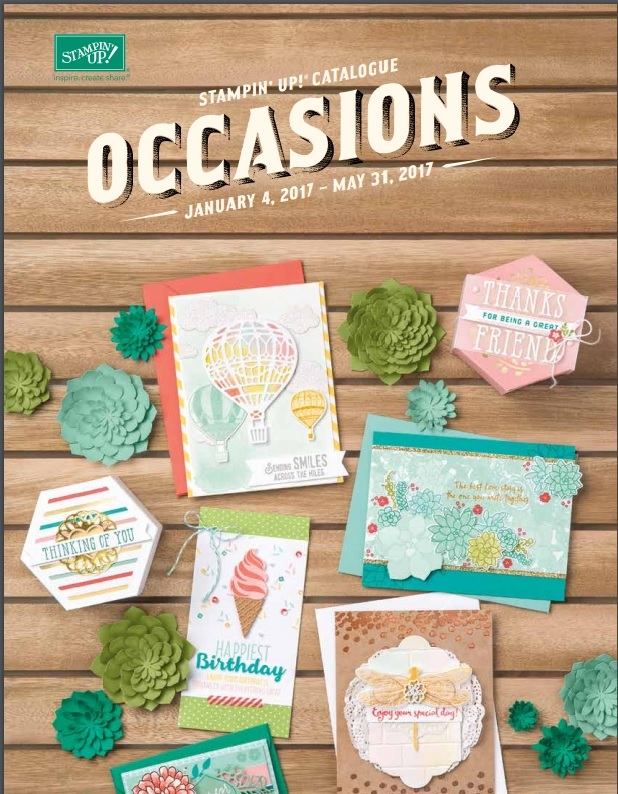 **New Products from the new 2017 Occasions Catalogue, available Jan, 4, 2017. Along with the Occasions Catalogue, will be the start of Sale-A-Bration 2017, Stampin' Up! 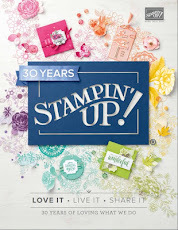 's biggest promotion of the year, where you can earn a selection of free products just by spending $60 with Stampin' Up! 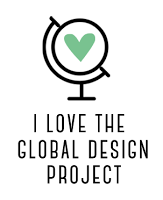 I am starting to hand out these catalogues now at events and in orders, so let me know if you'd like you'd like one and I'll make sure you get one. The background Designer Series Paper is called Cupcakes & Carousels DSP Stack** and I love the vintage feel of it, This design was perfect for my carousel pony and circus tents. 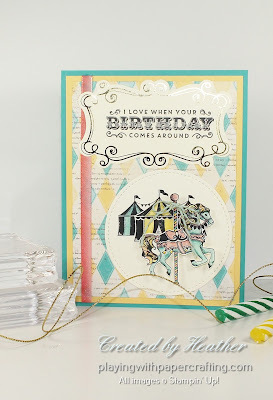 The pre-diecut label, the ombre ribbon and the Pool Party/gold Baker's Twine are all part of an Embellishment kit that goes along with this suite called...you guessed it...Cupcakes & Carousels Embellishment Kit**. 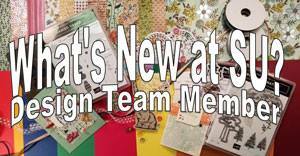 This kit also contains some sequins, some mini tassels and some Pool Party paper bows. I stamped the carousel pony, the tents and the sentiment in Basic Black Archival ink and colored in the tents and the pony with the Watercolour pencils**, blending them with a Blender Pen, I probably won't stop singing their praises until a least June, so prepare yourself. 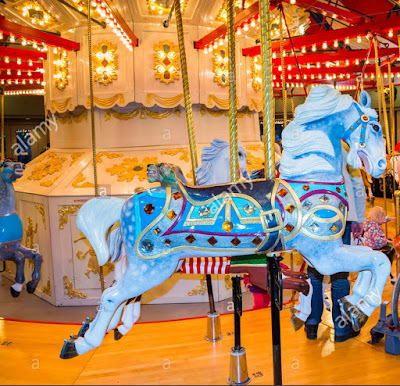 Alas, I had to fussy cut the pony as there is no coordinating die for it, unfortunately, but it wasn't too hard and it was well worth the effort, don't you think? The Stitched Shape Framelits formed the circle background for the stamped images. These are out of stock and unorderable right now, but will be available again January 16th! 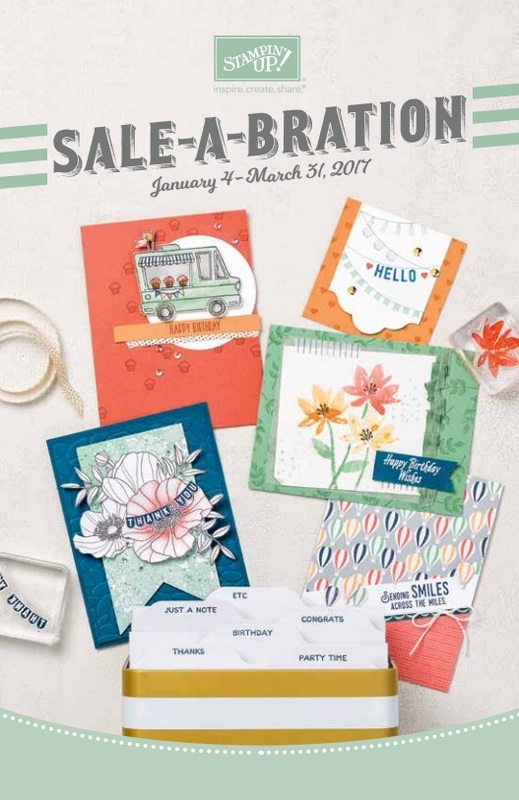 The Order Deadline for having products here in time for Christmas has come and gone, but you can still give the gift of Stampin' Up! for Christmas! The answer is a Gift Certificate. 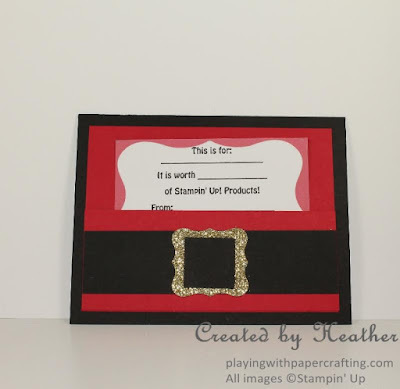 These can be any denomination and can be used for products or classes and they come in a cute little Santa belly gift envelope. I will be here until Monday, Dec.19, depending on the weather for you to pick one up. 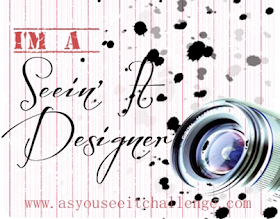 After that, I can email a gift certificate to you and you can print it off. It won't be as fancy, but it will get the job done! Contact me by phone or text at 250-768-7379, or email me. Merry Christmas from Playing with Papercrafting! 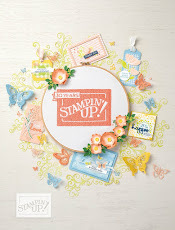 Popcorn and Movies with Stampin' Up! We Might As Well Dance! It's December and Time for Another Sale!